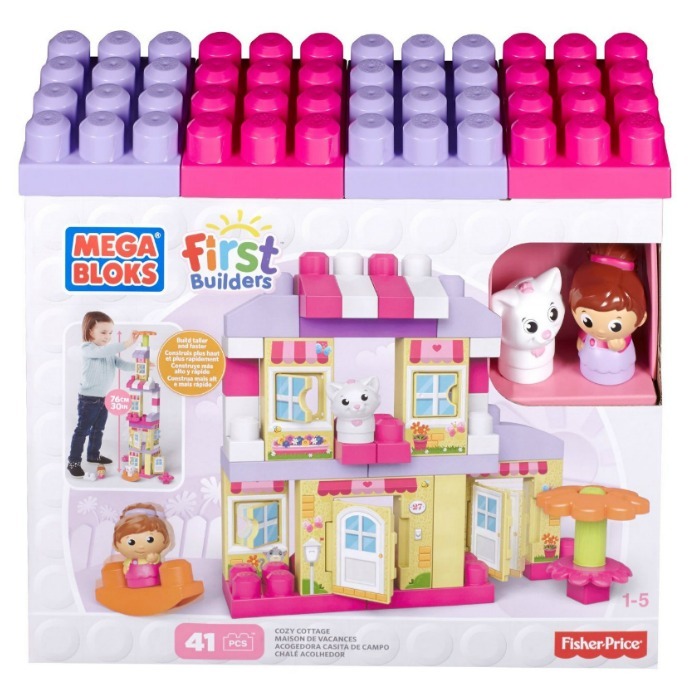 Mega Bloks First Builders Cozy Cottage Building Set Just $23.39! Ships FREE! You are here: Home / Great Deals / Amazon Deals / Mega Bloks First Builders Cozy Cottage Building Set Just $23.39! Ships FREE! Amazon has this Mega Bloks First Builders Cozy Cottage Building Set for just $23.39! Now your little designer can build a fun country home with the Cozy Cottage by Mega Bloks First Builders! The playset’s panel-style blocks allow for faster, taller building, while highly decorated printing brings to life a picture-perfect house with doors and windows that really open! Use the included First Builders blocks and special parts to build up to two feet high. Decorate the cottage, making a perfect country house for the included Block Buddy and her pet cat to play in. Add the finishing touches with a buildable flower that doubles as a patio umbrella and top off the day with a ride for two on the rocking seesaw. Ideal for ages 1 to 5.